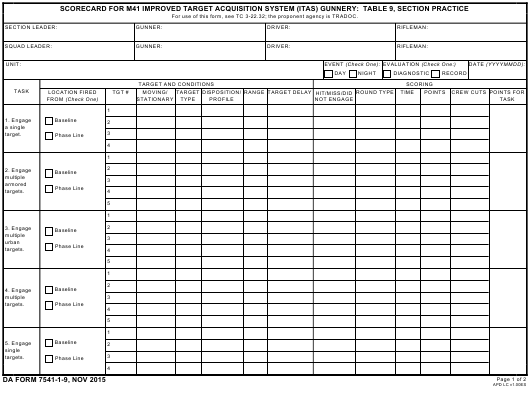 DA Form 7541-1-9 - also known as the "Scorecard For M41 Improved Target Acquisition System (itas) Gunnery: Table 9, Section Practice" - is a United States Military form issued by the Department of the Army. The form - often mistakenly referred to as the DD form 7541-1-9 - was last revised on October 1, 2015. Download an up-to-date fillable PDF version of the DA 7541-1-9 down below or look it up on the Army Publishing Directorate website. For use of this form, see TC 3-22.32; the proponent agency is TRADOC. Failed to close vehicle doors during reloading procedures. Failed to conduct weapon system checkout procedures prior to first engagement. Failed to lock the M41 ITAS in the 8-degree down position before reloading. Used incorrect TOW 2B missile attack mode for the target. Failed to announce any element of the fire command. Engaged target outside of TOW missile limitations. Fired or attempted to fire weapon system before the command of FIRE. Fired or attempted to fire a TOW missile before announcing, ON THE WAY. Failed to announce the type of TOW missile to load during reload procedures. Fired a TOW missile from a turret defiladed position. Failed to provide battle damage assessment at the end of the task. Fired a TOW missile while vehicle is still moving. Failed to determine target engageability. Raised arming lever without determining target type. Failed to properly distribute and control firing elements. Failed to ensure the side slope did not exceed 10 degrees. Engaged target prior to locking the track gates during an ATT engagement. Failed to identify friendly and noncombatant targets. Did not adhere to the task, conditions, and standards of the given engagement. Fired outside of the range fan. Did not wear proper uniform for CBRN engagements. Engaged friendly or noncombatant targets. Fired TOW missile with the cargo hatch open. Fired TOW missile with the elevation limiter in the down and pinned position. target with a TOW BB or a .50 cal). Fired TOW missile without visually inspecting the backblast area to ensure that it is clear. Fired TOW missile when the vehicle is not in the ready-to-fire configuration.